On the donation page, you will see an option to enter a flat donation amount by selecting the Monetary Donation item and entering and entering any amount in the Quantity Box, minimum $10 dollars. In order to be entered to win one of The Big Give prizes listed below, a minimum $50 donation is required. Each increment of $50 gets you another chance to win. 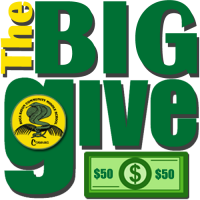 For instance, to enter for two Big Give items, you will need to donate $100. Note that the donations are listed as $50, $100, $150 or $200 items, meaning, to be entered into a drawing for the item we have listed, $50 gives you one entry, $100 gives you two entries, $150 gives you three entries and $200 gets you a bonus entry for a total of five entries. You can put all of your entries into one item or divide them up by individually selecting the items you are interested in from the dropdowns up to the number of entries provided. If you wish to donate over $200 you can either add a flat donation or add an additional Big Give $50, $100, $150 or $200 item to your cart. Be sure your selections are represented correctly when you check out. 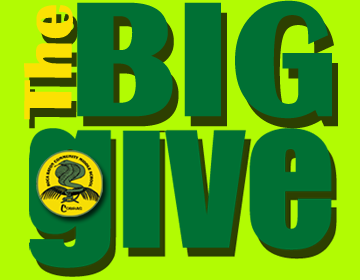 If you are entering for a chance to win a Big Give prize, here's is what we have to offer! One winner per prize! Tomasso's Pizza for a year - 52 one topping pizzas ($950 value). No delivery; up to 5 at a time. Xtreme Action Park Party Pack - $200 value; Includes 4, $25 game cards and 1 activity for 4 people. Boca Hoops Summer Camp - $160 value, chose between two campuses; t-shirt & lunch included. (We have two, one week camps available.). More detailed information is available just click the donation button below. Any donation is very much appreciated and each family donating will get one Cobra t-shirt! Keep your receipt for a free t-shirt. The t-shirts will be given at lunch in May but your child must have a receipt for the donation. The drawings will be done on April 30th by Mr. Slack and the winners will be notified by email or phone. Make sure to include your email, phone and student's name at check out so you can be contacted. The 2018/2019 BRCMS Spirit Rock is available for reservations and painting! Families/Students can reserve the face of the rock and paint positive messages to show their school spirit! You can paint the rock for your child/grandchild’s birthday, to thank a teacher or staff member, congratulatory events, good luck to teams and friends, or recognizing milestones. 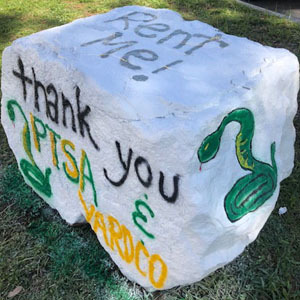 The rock is a wonderful way to improve school spirit and convey positive messages. The cost is $15 per day plus processing fees. 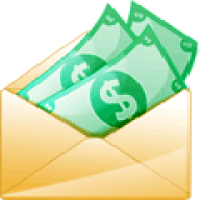 Fees include the Signup Genius charge of 5% purchase fee and .50 per transaction. Reserve and pay for your slot online but check in at the front desk upon arrival to paint. beginning at 4:30 the day before your rock reservation. A parent must check in at the front office with their student and a PTSA or staff member will Oversee the painting. 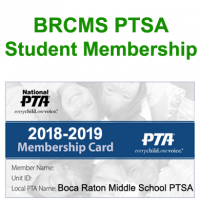 BRCMS PTSA is not responsible for reminders about your reservation and billing occurs automatically through the Signup Genius link. 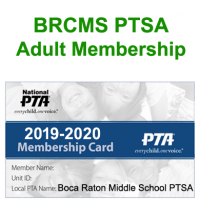 We invite you to join us as an Boca Middle PTSA member. 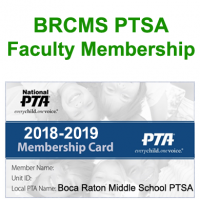 PTSA membership is open to anyone who cares about the education, health and welfare of our students and who supports the Mission and Purposes of PTSA. Parents, grandparents, teachers, administrators and community members are encouraged to join. You can join online by clicking here.